Everything Everywhere has announced the UK's first 4G network today, ushering in a new era in mobile browsing and data on the go. At a special event held at the Science Museum in London, with TechRadar in attendance, the Orange and T-Mobile partnership officially unveiled its 4G network under the new brand of EE. 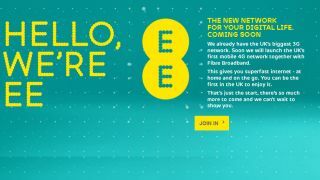 EE will stand alongside the 3G networks of Orange and T-Mobile, with the aim of supplying customers with super-fast 4G and fibre broadband. EE CEO Olaf Swantee said: "Today is the day we share our plans to build a new digital communication service for the UK – 4G". EE's 4G network will launch in a few weeks, so you'll be able to surf the super-fast network in time for Christmas. Everything Everywhere has already created a Twitter account for EE, where it is revealing more information about the new 4G service - including what areas will be covered and what devices will be 4G ready. According to EE, the first places to get 4G connectivity will be: Belfast, Birmingham, Bristol, Cardiff, Derby, Edinburgh, Glasgow, Hull, Leeds, Liverpool, London, Manchester, Nottingham, Newcastle, Sheffield and Southampton. All of these towns will have 4G by Christmas - today London, Cardiff, Birmingham and Bristol are being used for engineering testing. EE will be hoping to offer 70 per cent of of the population 4G by Christmas 2012, with 98 per cent 4G coverage to the UK by 2014. The devices to get 4G are: the Nokia Lumia 920 and 820, Samsung Galaxy S3 (4G version) and the Huawei Ascend P1. There will be two Huawei dongles available as well for laptops and PCs. EE also hinted more devices to some, with Swantee saying: "We'll be offering handsets from Samsung, HTC and Huawei and... one more thing... other firms soon." Oh, EE, you massive iPhone 5 tease. For more information on EE, head over to http://ee.co.uk.